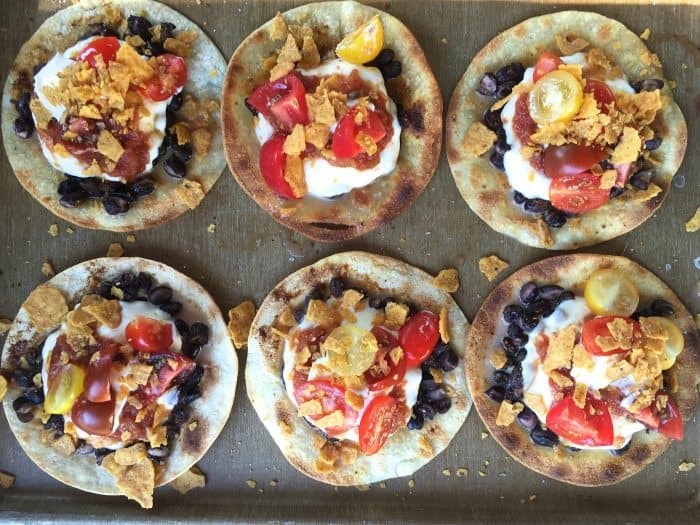 Enjoy vegetarian Crunchy Black Bean Mozzarella Tacos on a crispy open-face tortilla, soft enough to fold. 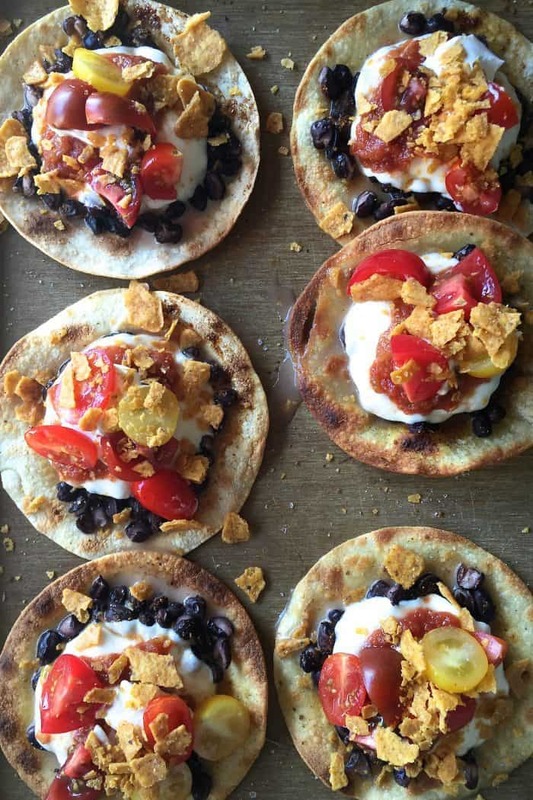 Broil and serve with your favorite taco toppings! 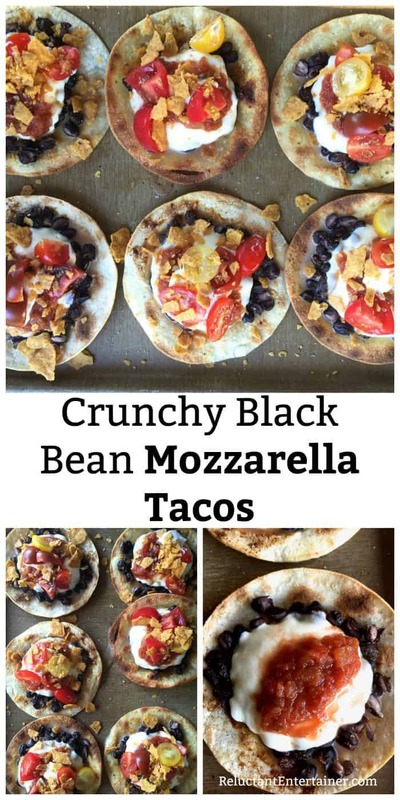 Enjoy an easy weeknight meal, these vegetarian Crunchy Black Bean Mozzarella Tacos for a light dinner! Plus today I’m sharing a few thoughts on cell phone etiquette around the table! 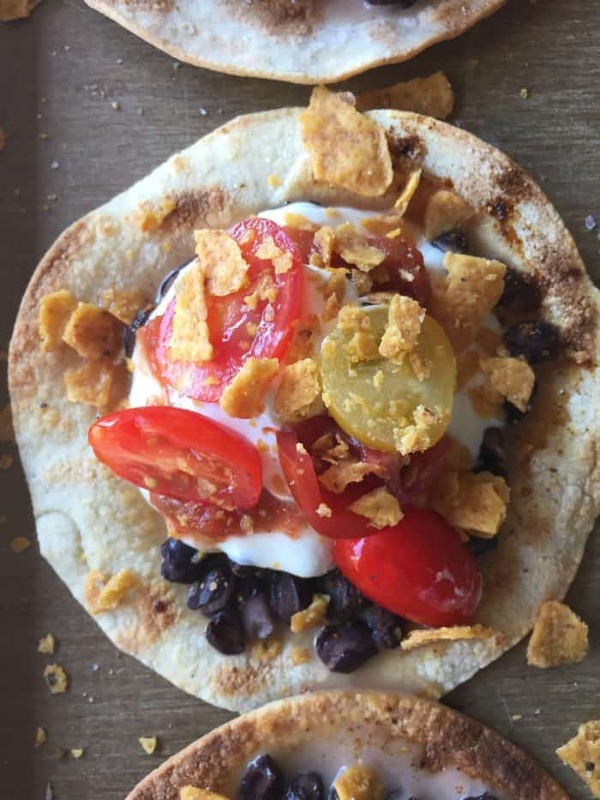 You may also love this super fun hosting idea: Crunchy Breaded Fish Sticks Taco Board. If you want to learn How to Fry Corn Tortillas for Tasty Soft Tacos, it’s a simple process! 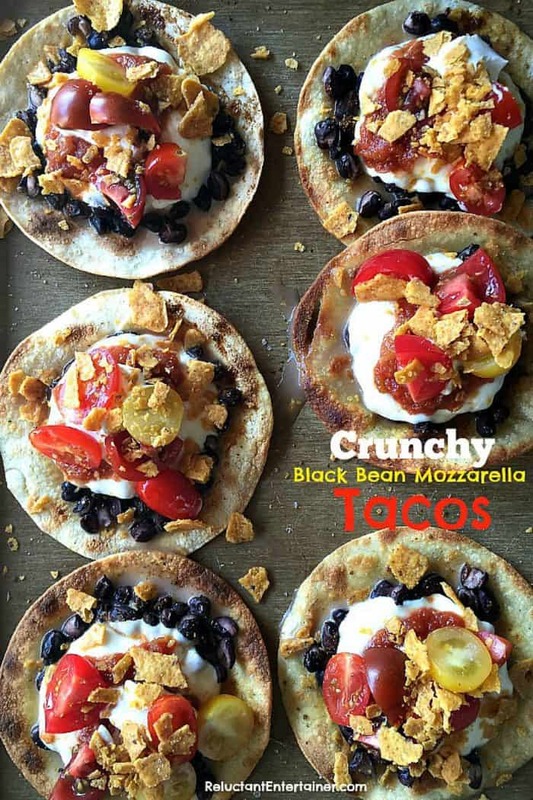 Cook a tiny bit longer for the “crunch” for these tasty tacos! 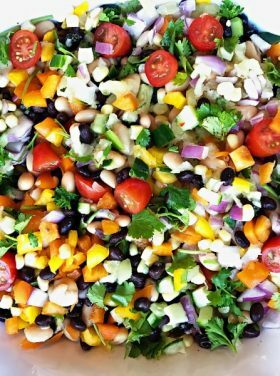 Bake and serve with a side of Mexican Rice Salad or Cucumber Tomato Avocado Salad with fresh cilantro! Not a lot, except when I put these pictures on Instagram a while back, everyone went crazy asking for the recipe! It’s a new way of making tacos for us. Cooking the tortillas in the pan (the method I grew up with), but then doing a final “broil” to melt the cheese and make the taco soft, gooey, bendable, yet still crunchy, and delicious. 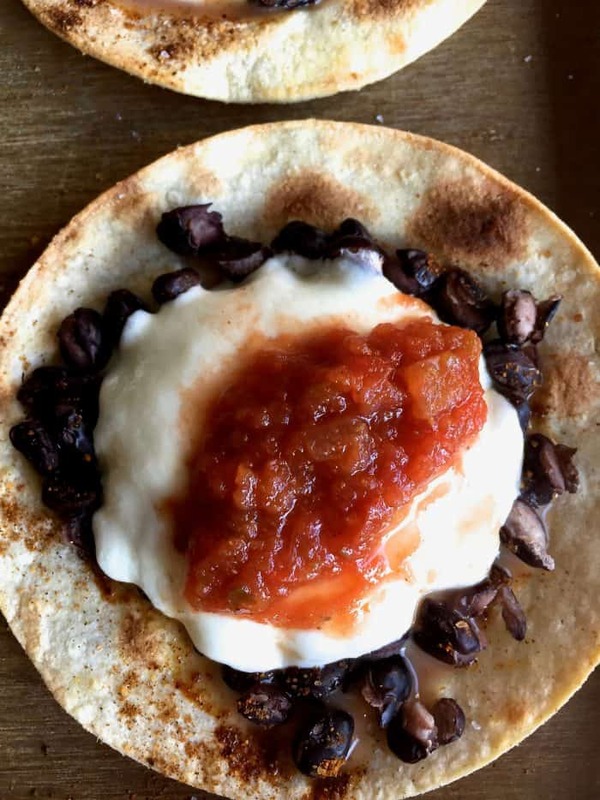 What I love about this method is you can prepare several large baking sheets of tacos (when cooking for a crowd), then pop them in the oven under the broiler for a few minutes, and you’ll have dinner on the table in no time! 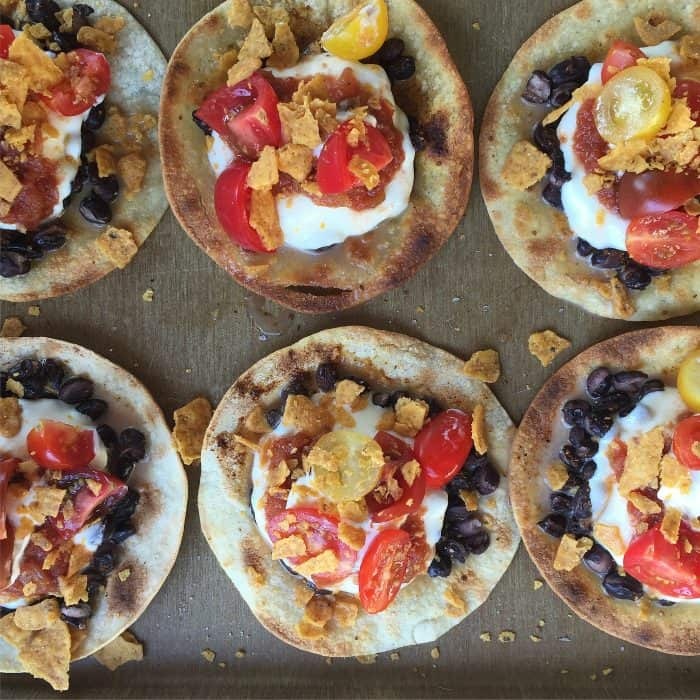 Serve with your favorite toppings, like fresh tomatoes, chips, guac, sour cream, cilantro, green onioons. And by the way, I buy the two pack of Bel Gioioso Fresh Mozzarella (from Costco). Pre-sliced! Finding the balance around cell phone use at a dinner party can be tricky. It’s not old-fashioned to ask guests to put their phones away, since after all, a dinner party is about socializing with the friends who are present. But I’m just not going to be that kind of hostess. Sometimes I wish we could bring back the olden days. Even though we don’t really deal with this in our home much (our friends are just too classy), it is definitely more noticeable with the younger generation. 1. Cell phone use can be insulting to the host. Rude to those around you. 2. Create a space where guests “stack the phones” when they come in (or put in a basket, on a tray, just somewhere easy for them to access if they need to). 4. This might be corny? But think of the old-fashioned days. Allow a periodic communal checking of phones and a potty break, in between courses.Think of it as a smoke break, and let your guests know that before the last course is served, everyone can take a break! 5. One of the most important virtues of a hostess is grace. Of course a phone may go off during the dinner party, with the guest jumping up to retrieve the call. 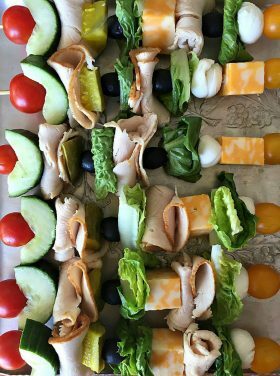 There may be a guest who wants to take a quick picture of a course that is being served (a compliment to the host), or there’s the “group shot” that always makes a dinner party fun. Allowing for grace and not being too rigid with rules always makes a party more enjoyable, even with a few surprises! At first, I didn’t think I would be able to manage. The good news is, I did not say no to the invitation, because I would know that I’d have no cell coverage. How sad would that have been? I took it as a challenge, got my work done ahead of time, and of course told our kids how they could reach us in case of emergency (Happy Camp, CA store), or said they could reach out to our local friends if they needed something. Then I let it all go. It was a blast not checking my phone 110 times a day. That’s right, my husband recently told me that a recent study shows people check their phones 110 a day. Holy Cow! I’m probably one of them. I learned a lot about myself this past weekend: What I am going to be ruled by and what I am not. And next time you are invited to a dinner party, I would love for you to email me your thoughts on how the group handled cell phone etiquette! What do you do about cell phones when guests come to dinner at your home, or do you go with the flow? Heat oil in small skillet to 375 degrees. Cook the tortillas for 1 minute on each side, removing to a paper towel (to absorb any oil). Continue until all 12 tortillas are cooked. In a small sauce pan, heat the beans with lime juice and cumin until heated through. 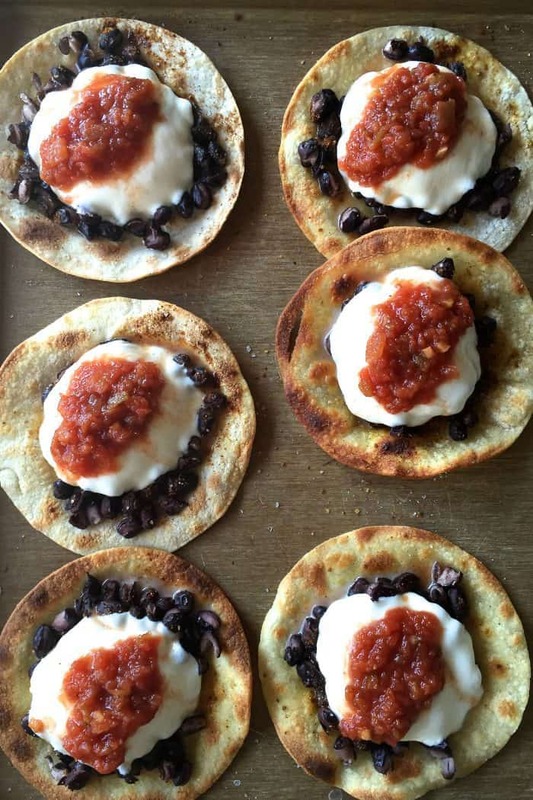 Line the tortillas on one or more baking sheets. 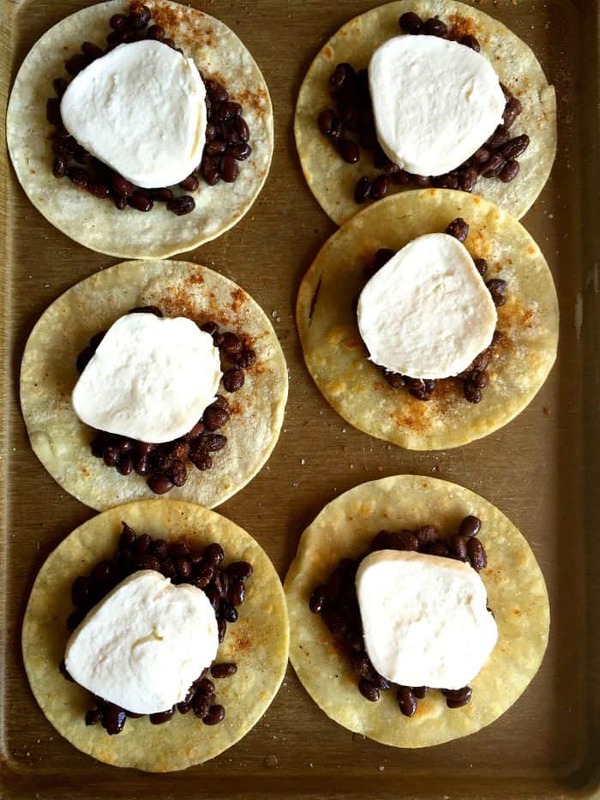 Top each tortilla with about 1/8 cup of black beans, and then a thick slice of mozzarella cheese. Top with a dab of salsa. Heat the oven to broil. Broil the tacos on HI for about 3-4 minutes, until bubbly and crunchy. 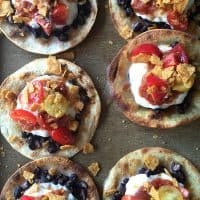 Top with fresh tomatoes and crunched-up taco chips. Serve! 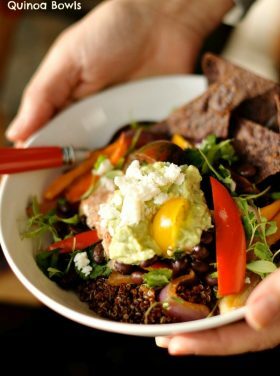 Extra toppings may include sour cream, guacamole, and fresh chopped cilantro. I absolutely LOVE my Le Creuset skillet and saucepan for these types of recipes! This recipe looks and sounds absolutely delicious! I was at the Dollar Tree last week and thought of you while I was on the drink-ware aisle. They have a really nice selection right now. Not corny at all! I’m on the same page with you. This is something we’ve been working really hard on as well! I so agree about the cell phone thing. Way back when I worked outside the home I left my cell and my pager in my car when I went to see a customer. I didn’t even think it was polite to look at either (to see who it was) while I was taking up that persons time. The only cell phone I have now is always turned off unless I have an emergency and need to use it. I’ve been guilty myself when checking it while checking out at grocery store. Ugh. I catch mysef and put in my purse, and then make eye contact with the checker. So hard … great tip on leaving it in the car, Karen! Sandy, I love your comments on cell phones & hostessing! I agree that it should all be about those present…and grace! Having this for dinner tonight! We are trying to eat lighter and this fits the bill pretty well. We love black beans. Cell phones…we love them and we hate them. If people would just use a little common sense it would help. Phones at the dinner table, in church, in the bathroom…those places just don’t make sense. Yup, Stacey … agree. Love them, and hate them! Cell phone use drives me nuts. I get the occasional picture, or if you have smaller kids and a sitter needs to contact you…but when in a social setting and people are checking instagram or FB or texting others, it drives me nuts. I went to a “dumb phone” a few years ago due to finances and it really made me realize how much phones are used ALL THE TIME. When all you can do is call or text, there’s not much need to have it out. Sometimes I keep it close by in case my girls need something but I usually tell them I won’t be available during such and such time. But I don’t really say anything to others. I am so glad you wrote about this topic, Sandy. It’s amazing how impolite many people have become because of the obsessive need to always check their phones. I think smartphones are fantastic in so many ways, but many people have lost balance and are quite literally missing out on Life because they’re always checking their phones! My husband and I have gone out to dinner with friends and some of them were regularly checking their phones throughout dinner. I have even been to family dinners where family members have sat at the table looking at their phone. I think it is fine for people to use their phones at appropriate times during a dinner party just as you suggested–to take pictures, or accept an important or emergency phone call, but that’s about it. Pictures can wait to be posted on social media. It’s all about balance and proper manners. It is about proper manners. I don’t mind checking if everyone is at the same time, but then back into the purse it needs to go. I struggle with this myself … but we’re really trying to not be “those people” Flavia! Thanks for sharing, girl!